Sierra Leone (/siˌɛrə liˈoʊn(i)/, UK also /siˌɛərə -/), officially the Republic of Sierra Leone, informally Salone, is a country on the southwest coast of West Africa. It has a tropical climate, with a diverse environment ranging from savanna to rainforests. The country has a total area of 71,740 km2 (27,699 sq mi) and a population of 7,075,641 as of the 2015 census. Sierra Leone is a constitutional republic with a directly elected president and a unicameral legislature. The country's capital and largest city is Freetown. Sierra Leone is made up of five administrative regions: the Northern Province, North West Province, Eastern Province, Southern Province and the Western Area. These regions are subdivided into sixteen districts. Anthem: "High We Exalt Thee, Realm of the Free"
Sierra Leone was a British Crown Colony from 1808 to 1961. Sierra Leone became independent from the United Kingdom on 27 April 1961, led by Sir Milton Margai, who became the country's first prime minister. In May 1962, Sierra Leone held its first general elections as an independent nation. On 19 April 1971, Siaka Stevens' government abolished Sierra Leone's parliamentary government system and declared Sierra Leone a presidential republic. From 1978 to 1985, Sierra Leone was a one-party state in which Stevens' APC was the only legal political party in the country. The current constitution of Sierra Leone, which includes multiparty democracy, was adopted in 1991 by the government of President Joseph Saidu Momoh, Stevens' hand-picked successor. On 23 March 1991, a rebel group known as the Revolutionary United Front led by a former Sierra Leone army officer Foday Sankoh launched an eleven-year brutal civil war in the country, in an unsuccessful attempt to overthrow the Sierra Leone government. In April 1992, a group of junior army officers in their twenties overthrew president Momoh from power, and their leader a 25 year old captain Valentine Strasser became the world's youngest Head of State. In January 1996 Brigadier General Julius Maada Bio returned the country to multi-party democracy and the 1991 constitution was reestablished. Bio handed power to Ahmad Tejan Kabbah after his victory in the 1996 Sierra Leone presidential election. In 1997, the military overthrew President Kabbah. However, in February 1998, a coalition of West African Ecowas armed forces led by Nigeria removed the military junta from power by force and President Kabbah was reinstated as president. Sierra Leone has had an uninterrupted democracy from 1998 to present. In January 2002, President Ahmad Tejan Kabbah fulfilled his campaign promise by officially ending the civil war as the rebels were defeated by military force with the help and support of Ecowas, the British government, the African Union, and the United Nations. 16 ethnic groups inhabit Sierra Leone, each with its own language and customs. The two largest and most influential are the Temne and Mende. The Temne are predominantly found in the northwest of the country, and the Mende are predominant in the southeast. Comprising a small minority, about 2%, are the Krio people, who are descendants of freed African-American and West Indian slaves. Although English is the official language, used in schools and government administration, Krio, an English-based creole, is the most widely spoken language across Sierra Leone and is spoken by 98% of the country's population. The Krio language unites all the different ethnic groups in the country, especially in their trade and social interaction. Sierra Leone has relied on mining, especially diamonds, for its economic base. It is also among the largest producers of titanium and bauxite, is a major producer of gold, and has one of the world's largest deposits of rutile. Sierra Leone is home to the third-largest natural harbour in the world. Despite this natural wealth, 53% of its population lived in poverty in 2011. Sierra Leone is a member of many international organisations, including the United Nations, the African Union, the Economic Community of West African States (ECOWAS), the Mano River Union, the Commonwealth of Nations, the African Development Bank and the Organisation of Islamic Cooperation. Archaeological finds show that Sierra Leone has been inhabited continuously for at least 2,500 years, populated successively by societies who migrated from other parts of Africa. The people adopted the use of iron by the 9th century and by 1000 AD agriculture was being practised along the coast. The climate changed considerably and boundaries among different ecological zones changed as well, affecting migration and conquest. Sierra Leone's dense tropical rainforest and swampy environment was considered impenetrable; it was also host to the tsetse fly, which carried a disease fatal to horses and the zebu cattle used by the Mande people. This environmental factor protected its people from conquests by the Mande and other African empires. This also reduced the Islamic influence of the Mali Empire but Islam, introduced by Susu traders, merchants and migrants from the north and east, became widely adopted in the 18th century. European contacts within Sierra Leone were among the first in West Africa in the 15th century. In 1462, Portuguese explorer Pedro de Sintra mapped the hills surrounding what is now Freetown Harbour, naming the shaped formation Serra da Leoa or "Serra Leoa" (Portuguese for Lioness Mountains). 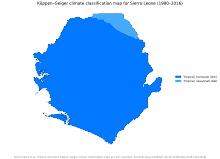 The Spanish rendering of this geographic formation is Sierra Leona, which later was adapted and, misspelled, became the country's current name. Although according to the professor C. Magbaily Fyle this could have been a misinterpretation of historians: according to him, there has been evidence of travellers calling the region Serra Lyoa well before 1462, the year when Sintra first arrived. This would imply that the identity of the person who named Sierra Leone still remains unclear. Soon after Sintra's expedition, Portuguese traders arrived at the harbour. By 1495 they had built a fortified trading post on the coast. The Dutch and French also set up trade here, and each nation used Sierra Leone as a trading point for slaves brought by African traders from interior areas undergoing tribal wars and conflicts over territory. In 1562, the English initiated the Triangle Trade when admiral Sir John Hawkins of the Royal Navy transported 300 enslaved Africans – acquired "by the sword and partly by other means" – to the Spanish colony of Santo Domingo on Hispaniola in the Caribbean Sea area of the West Indies islands, where he sold them. Following the American Revolutionary War, the British evacuated thousands of freed African-American slaves and resettled them in Canadian and Caribbean colonies and London, which gave them new lives. In 1787 the British Crown founded a settlement in Sierra Leone in what was called the "Province of Freedom". It intended to resettle some of the "Black Poor of London", mostly African-Americans freed by the British during the war. About 400 blacks and 60 whites reached Sierra Leone on 15 May 1787. The group also included some West Indians of African descent from London. After they established Granville Town, most of the first group of colonists died, owing to disease and warfare with the indigenous African peoples (Temne), who resisted their encroachment. The 64 remaining colonists established a second Granville Town. The Settlers built Freetown in the styles they knew from their lives in the American South; they also continued American fashion and American manners. In addition, many continued to practice Methodism in Freetown. Black settlers in Sierra Leone enjoyed much more autonomy in that they were more politically engaged. Black immigrants elected different levels of political representatives, 'tithingmen', who represented each dozen settlers, and 'hundreders' who represented larger amounts. This sort of representation was not available in Nova Scotia. The initial process of society-building in Freetown, however, was a harsh struggle. The Crown did not supply enough basic supplies and provisions, and the Settlers were continually threatened by illegal slave trading and the risk of re-enslavement. In the 1790s, the Settlers, including adult women, voted for the first time in elections. The Sierra Leone Company, controlled by London investors, refused to allow the settlers to take freehold of the land. In 1799 some of the settlers revolted. The Crown subdued the revolt by bringing in forces of more than 500 Jamaican Maroons, whom they transported from Cudjoe's Town (Trelawny Town) via Nova Scotia in 1800. Led by Colonel Montague James, the Maroons helped the colonial forces to put down the revolt, and in the process they secured the best houses and farms. At about the same time (following the abolition of the slave trade in 1807), British crews delivered thousands of formerly enslaved Africans to Freetown, after liberating them from illegal slave ships. These Liberated Africans or recaptives were sold for $20 a head as apprentices to the white settlers, Nova Scotian Settlers, and the Jamaican Maroons. Some of the recaptives who were not sold as apprentices were forced to join the Navy. Many recaptives were treated poorly and even abused because some of the original settlers considered them their property. Cut off from their various homelands and traditions, the Liberated Africans were forced to assimilate to the Western styles of Settlers and Maroons. For example, some of the recaptives were forced to change their name to a more Western sounding one. Though some people happily embraced these changes because they considered it as being part of the community, some were not happy with these changes and wanted to keep their own identity. Many recaptives were so unhappy that they risked the possibility of being sold back into slavery by leaving Sierra Leone and going back to their original villages. They built a flourishing trade in flowers and beads on the West African coast. The settlement of Sierra Leone in the 1800s was unique in that the population was composed of displaced Africans who were brought to the colony after the Spanish abolition of the slave trade in 1807. Upon arrival in Sierra Leone, each "recaptive" was given a registration number, and information on their physical qualities would be entered into the Register of Liberated Africans. However, oftentimes the documentation would be overwhelmingly subjective and would result in inaccurate entries, making them difficult to track. In addition, differences between the Register of Liberated Africans of 1808 and the List of Captured Negroes of 1812 (which emulated the 1808 document) revealed some disparities in the entries of the recaptives, specifically in the names; many recaptives decided to change their given names to more anglicised versions which contributed to the difficulty in tracking them after they arrived in Sierra Leone. According to the British Act for the Abolition of the Slave Trade in 1807, the recaptives could be subject to apprenticeships led by British colonists in Sierra Leone and the males enlisted into the Army or Navy. In many instances, the recaptives who were assigned to apprenticeships were sold for $20, giving the apprenticeship system qualities similar to slavery. It is documented that the recaptive apprentices were unpaid and the settlers who they were appointed to had devices which could be used to discipline them, namely sticks. According to Suzanne Schwartz, a historian on colonial Sierra Leone, in June 1808 a group of 21 men and women ran away to the nearby native settlement of Robiss and upon recapture were imprisoned by the settlers in Sierra Leone, thus contributing to the slavery-like qualities of the apprenticeship system. The British interacted mostly with the Krios in Freetown, who did most of the trading with the indigenous peoples of the interior. In addition, educated Krios held numerous positions in the colonial government, giving them status and good-paying positions. Following the Berlin Conference of 1884–1885, the UK decided that it needed to establish more dominion over the inland areas, to satisfy what was described by the European powers as "effective occupation" of territories. In 1896 it annexed these areas, declaring them the Sierra Leone Protectorate. With this change, the British began to expand their administration in the region, recruiting British citizens to posts, and pushing Krios out of positions in government and even the desirable residential areas in Freetown. Colonel Frederic Cardew, military governor of the Protectorate, in 1898 established a new tax on dwellings and demanded that the chiefs use their peoples to maintain roads. The taxes were often higher than the value of the dwellings, and 24 chiefs signed a petition to Cardew, stating how destructive this was; their people could not afford to take time off from their subsistence agriculture. They resisted payment of taxes. Tensions over the new colonial requirements, and the administration's suspicions about the chiefs led to the Hut Tax war of 1898, also called the Temne-Mende War. The British fired first. The Northern front of majority Temne people was led by Bai Bureh. The Southern front, consisting mostly of Mende people, entered conflict somewhat later and for different reasons. For several months, Bureh's fighters had the advantage over the vastly more powerful British forces, but the British troops and Bureh's warriors suffered hundreds of fatalities. Bai Bureh finally surrendered on 11 November 1898 to end the destruction of his people's territory and dwellings. Although the British government recommended leniency, Cardew insisted on sending the chief and two allies into exile in the Gold Coast; his government hanged 96 of the chief's warriors. Bai Bureh was allowed to return in 1905, when he resumed his chieftaincy of Kasseh. British West African Campaign troops in Freetown, 1914–1916. Published caption: "British expeditionary force preparing to embark at Freetown to attack the German Cameroons, the main object of the attack being the port of Duala. Auxiliary native troops were freely used in African warfare." African Naval ratings march past the Governor of Sierra Leone, Hubert Stevenson. The defeat of the Temne and Mende in the Hut Tax war ended mass resistance to the Protectorate and colonial government, but intermittent rioting and labour unrest continued throughout the colonial period. Riots in 1955 and 1956 involved "many tens of thousands" of Sierra Leonians in the protectorate. Domestic slavery, which continued to be practised by local African elites, was abolished in 1928. A notable event in 1935 was the granting of a monopoly on mineral mining to the Sierra Leone Selection Trust, run by De Beers. The monopoly was scheduled to last 98 years. Mining of diamonds in the east and other minerals expanded, drawing labourers there from other parts of the country. In 1924, the UK government divided Sierra Leone into a Colony and a Protectorate, with different political systems constitutionally defined for each. The Colony was Freetown and its coastal area; the Protectorate was defined as the hinterland areas dominated by local chiefs. Antagonism between the two entities escalated to a heated debate in 1947, when proposals were introduced to provide for a single political system for both the Colony and the Protectorate. Most of the proposals came from leaders of the Protectorate, whose population far outnumbered that in the colony. The Krios, led by Isaac Wallace-Johnson, opposed the proposals, as they would have resulted in reducing the political power of the Krios in the Colony. In 1951, educated protectorate leaders from different groups, including Sir Milton Margai, Lamina Sankoh, Siaka Stevens, Mohamed Sanusi Mustapha, John Karefa-Smart, Kande Bureh, Sir Albert Margai, Amadu Wurie and Sir Banja Tejan-Sie joined together with the powerful paramount chiefs in the protectorate to form the Sierra Leone People's Party or SLPP as the party of the protectorate. The SLPP leadership, led by Sir Milton Margai, negotiated with the British and the educated Krio-dominated colony based in Freetown to achieve independence. Owing to the astute politics of Milton Margai of the Mende, the educated Protectorate elite was won over to join forces with the paramount chiefs in the face of Krio intransigence. Later, Margai used the same skills to win over opposition leaders and moderate Krio elements to achieve independence from the UK. In November 1951, Margai oversaw the drafting of a new constitution, which united the separate Colonial and Protectorate legislatures and provided a framework for decolonisation. In 1953, Sierra Leone was granted local ministerial powers and Margai was elected Chief Minister of Sierra Leone. The new constitution ensured Sierra Leone a parliamentary system within the Commonwealth of Nations. 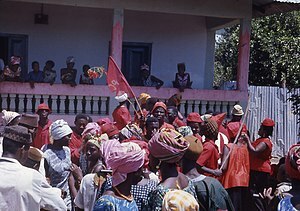 In May 1957, Sierra Leone held its first parliamentary election. The SLPP, which was then the most popular political party in the colony of Sierra Leone as well as being supported by the powerful paramount chiefs in the provinces, won the most seats in Parliament and Margai was re-elected as Chief Minister by a landslide. On 20 April 1960, Milton Margai led a 24-member Sierra Leonean delegation at constitutional conferences that were held with the Government of Queen Elizabeth II and British Colonial Secretary Iain Macleod in negotiations for independence held in London. On 27 April 1961, Sir Milton Margai led Sierra Leone to independence from Great Britain and became the country's first Prime Minister. Thousands of Sierra Leoneans took to the streets in celebration. The republic retained a parliamentary system of government and was a member of the Commonwealth of Nations. The leader of the main opposition All People's Congress (APC), Siaka Stevens, along with Isaac Wallace-Johnson, another outspoken critic of the SLPP government, were arrested and placed under house arrest in Freetown, along with sixteen others charged with disrupting the independence celebration. In May 1962, Sierra Leone held its first general election as an independent nation. The Sierra Leone People's Party (SLPP) won a plurality of seats in parliament, and Milton Margai was re-elected as prime minister. Margai was very popular among Sierra Leoneans during his time in power, most known for his self-effacement. He was neither corrupt nor did he make a lavish display of his power or status. He based the government on the rule of law and the separation of powers, with multiparty political institutions and fairly viable representative structures. Margai used his conservative ideology to lead Sierra Leone without much strife. He appointed government officials to represent various ethnic groups. Margai employed a brokerage style of politics, by sharing political power among political parties and interest groups; and with the powerful paramount chiefs in the provinces, most of whom were key allies of his government. Upon Milton Margai's unexpected death in 1964, his half-brother, Sir Albert Margai, was appointed as Prime Minister by parliament. Sir Albert's leadership was briefly challenged by Foreign Minister John Karefa-Smart, who questioned Sir Albert's succession to the SLPP leadership position. Karefa-Smart led a prominent small minority faction within the SLPP party in opposition of Albert Margai as Prime Minister. However, Kareefa-Smart failed to receive strong support within the SLPP and the SLPP dominated members of parliament in his attempt to have Albert Margai stripped of his position as the leader of the SLPP and prime minister of the country. The large majority of SLPP members backed Albert Margai over Kareefa-Smart. Soon after Albert Margai was sworn in as Prime Minister, he dismissed several senior government officials who had served under his elder brother Milton's government, viewing them as a threat to his administration, including Kareefa-Smart. Sir Albert resorted to increasingly authoritarian actions in response to protests and enacted several laws against the opposition All People's Congress (APC), whilst attempting to establish a one-party state. Sir Albert was opposed to the colonial legacy of allowing executive powers to the Paramount Chiefs, many of whom had been key allies of his late brother Sir Milton. Accordingly, they began to consider Sir Albert a threat to the ruling houses across the country. Margai appointed many non-Creoles to the country's civil service in Freetown, in an overall diversification of the civil service in the capital, which had been dominated by members of the Creole ethnic group. As a result, Albert Margai became unpopular in the Creole community, many of whom had supported Sir Milton. Margai was accused of favoring members of his own Mende ethnic group for prominent positions. In 1967, riots broke out in Freetown against Margai's policies; in response he declared a state of emergency across the country. Sir Albert was accused of corruption and of a policy of affirmative action in favor of his own Mende ethnic group. Although possessing the full backing of the country's security forces, he called for free and fair elections. The APC, with its leader Siaka Stevens, narrowly won a small majority of seats in Parliament over the SLPP in a closely contested 1967 general election. Stevens was sworn in as Prime Minister on 21 March 1967. Within hours after taking office, Stevens was ousted in a bloodless military coup led by Brigadier General David Lansana, the commander of the Sierra Leone Armed Forces. He was a close ally of Albert Margai, who had appointed him to the position in 1964. Lansana placed Stevens under house arrest in Freetown and insisted that the determination of Prime Minister should await the election of the tribal representatives to the House. Upon his release, Stevens went into exile in Guinea. On 23 March 1967, a group of military officers in the Sierra Leone Army led by Brigadier General Andrew Juxon-Smith, overrode this action by a coup d'état; they seized control of the government, arresting Lansana, and suspending the constitution. The group set up the National Reformation Council (NRC), with Andrew Juxon-Smith as its chairman and Head of State of the country. On 18 April 1968 a group of low ranking soldiers in the Sierra Leone Army who called themselves the Anti-Corruption Revolutionary Movement (ACRM), led by Brigadier General John Amadu Bangura, overthrew the NRC junta. The ACRM junta arrested many senior NRC members. They reinstated the constitution and returned power to Stevens, who at last assumed the office of Prime Minister. Stevens reorganised the country's oil refinery, the government-owned Cape Sierra Hotel, and a cement factory. He cancelled Juxon-Smith's construction of a church and mosque on the grounds of Victoria Park (since mid 2017 Freetown Amusement Park). Stevens began efforts that would later bridge the distance between the provinces and the city. Roads and hospitals were constructed in the provinces, and Paramount Chiefs and provincial peoples became a prominent force in Freetown. Under pressure of several coup attempts, real or perceived, Stevens' rule grew more and more authoritarian, and his relationship with some of his ardent supporters deteriorated. He removed the SLPP party from competitive politics in general elections, some believed, through the use of violence and intimidation. To maintain the support of the military, Stevens retained the popular John Amadu Bangura as the head of the Sierra Leone Armed Forces. After the return to civilian rule, by-elections were held (beginning in autumn 1968) and an all-APC cabinet was appointed. Calm was not completely restored. In November 1968, unrest in the provinces led Stevens to declare a state of emergency across the country. Many senior officers in the Sierra Leone Army were greatly disappointed with Stevens' policies and his handling of the Sierra Leone Military, but none could confront Stevens. Brigadier General Bangura, who had reinstated Stevens as Prime Minister, was widely considered the only person who could control Stevens. The army was devoted to Bangura, and this made him potentially dangerous to Stevens. In January 1970, Bangura was arrested and charged with conspiracy and plotting to commit a coup against the Stevens government. After a trial that lasted a few months, Bangura was convicted and sentenced to death. On 29 March 1970, Brigadier Bangura was executed by hanging in Freetown. After the execution of Bangura, a group of soldiers loyal to the executed Brigadier Bangura held a mutiny in the capital Freetown and in some other parts of the country in opposition of Stevens' government. Dozens of soldiers were arrested and convicted by a court martial in Freetown for their participation in the mutiny against president Stevens. Among the soldiers arrested was a little known army Corporal Foday Sankoh, a strong supporter of Bangura. Corporal Sankoh was convicted and jailed for seven years at the Pademba Road Prison in Freetown. An alleged plot to overthrow president Stevens failed in 1974 and its leaders were executed. In mid 1974, Guinean soldiers, requested by Stevens, were in the country to help maintain his hold on power as Stevens was a close ally of then Guinean president Ahmed Sekou Toure. In March 1976, Stevens was elected without opposition for a second five-year term as president. On 19 July 1975, 14 senior army and government officials including David Lansana, former cabinet minister Mohamed Sorie Forna (father of writer Aminatta Forna), Brigadier General Ibrahim Bash Taqi and Lieutenant Habib Lansana Kamara were executed after being convicted of allegedly attempting a coup to topple president Stevens' government. In 1977, a nationwide student demonstration against the government disrupted Sierra Leone politics. The demonstration was quickly put down by the army and Stevens' own personal Special Security Division (SSD) force, a heavily armed paramilitary force he had created to protect him and to maintain his hold on power. The SSD officers were very loyal to Stevens and were deployed across Sierra Leone to put down any rebellion or protest against Stevens' government. A general election was called later that year in which corruption was again endemic; the APC won 74 seats and the SLPP 15. In 1978, the APC-dominant parliament approved a new constitution making the country a one-party state. The 1978 constitution made the APC the only legal political party in Sierra Leone. This move led to another major demonstration against the government in many parts of the country, but again it was put down by the army and Stevens' SSD forces. Stevens is generally criticised for dictatorial methods and government corruption, but on a positive note, he kept the country stable and from collapsing into civil war. He built several government institutions that are still in use today. Stevens also reduced ethnic polarisation in government by incorporating members of various ethnic groups into his all-dominant APC government. Siaka Stevens retired from politics in November 1985 after being in power for eighteen years. The APC named a new presidential candidate to succeed Stevens at their last delegate conference held in Freetown in November 1985. He was Major General Joseph Saidu Momoh, the head of the Republic of Sierra Leone Armed Forces and Stevens' own choice to succeed him. As head of the Sierra Leone Armed Forces, Major General Momoh was very loyal to Stevens, who had appointed him to the position. Like Stevens, Momoh was also a member of the minority Limba ethnic group. Momoh was elected president as the only contesting candidate, without any opposition, and was sworn in as Sierra Leone's second president on 28 November 1985 in Freetown. A one-party parliamentary election between APC members was held in May 1986. President Momoh appointed his former military colleague and key ally, Major General Mohamed Tarawalie to succeed him as the head of the Sierra Leone Military. Major General Tarawalie was also a strong loyalist and key supporter of president Momoh. President Momoh named James Bambay Kamara as the head of the Sierra Leone Police. Bambay Kamara was a key loyalist and strong supporter of President Momoh. Momoh broke away from former president Siaka Stevens, by integrating the powerful SSD into the Sierra Leone Police as a special paramilitary force of the Sierra Leone Police. Under President Stevens, the SSD had been a powerful personal force used to maintain his hold on power, independent from the Sierra Leone Military and Sierra Leone Police Force. The Sierra Leone Police under Bambay Kamara's leadership, was accused of physical violence, arrest and intimidation against critics of President Momoh's government. President Momoh's strong links with the army and his verbal attacks on corruption earned him much-needed initial support among Sierra Leoneans. With the lack of new faces in the new APC cabinet under president Momoh and the return of many of the old faces from Stevens' government, criticisms soon arose that Momoh was simply perpetuating the rule of Stevens. The next couple of years under the Momoh administration were characterised by corruption, which Momoh defused by sacking several senior cabinet ministers. To formalise his war against corruption, President Momoh announced a "Code of Conduct for Political Leaders and Public Servants." After an alleged attempt to overthrow President Momoh in March 1987, more than 60 senior government officials were arrested, including Vice President Francis Minah, who was removed from office, convicted of plotting the coup, and executed by hanging in 1989 along with 5 others. In October 1990, owing to mounting pressure from both within and outside the country for political and economic reform, president Momoh set up a constitutional review commission to assess the 1978 one-party constitution. Based on the commission's recommendations a constitution re-establishing a multi-party system was approved by the exclusive APC Parliament by a 60% majority vote, becoming effective on 1 October 1991. There was great suspicion that president Momoh was not serious about his promise of political reform, as APC rule continued to be increasingly marked by abuses of power. On 29 April 1992, a group of young soldiers in the Sierra Leone Army, led by seven army officers — Lieutenant Sahr Sandy, Captain Valentine Strasser, Sargent Solomon Musa, Captain Komba Mondeh, Lieutenant Tom Nyuma, Captain Julius Maada Bio and Captain Komba Kambo— launched a military coup that sent president Momoh into exile in Guinea, and the young soldiers established the National Provisional Ruling Council (NPRC), with 25-year-old Captain Valentine Strasser as its chairman and Head of State of the country. The NPRC Junta maintained relations with the Economic Community of West African States (ECOWAS) and strengthened support for Sierra Leone-based ECOMOG troops fighting in Liberia. On 28 December 1992, an alleged coup attempt against the NPRC government of Strasser, aimed at freeing the detained Colonel Yahya Kanu, Colonel Kahota M.S. Dumbuya and former inspector general of police Bambay Kamara, was foiled. Several Junior army officers led by Seargen Mohamed Lamin Bangura were identified as being behind the coup plot. The coup plot led to the firing squad execution of seventeen soldiers in the Sierra Leone Army including Colonel Kahota M Dumbuya, Major Yayah Kanu and Seargent Mohamed Lamin Bangura. Several prominent members of the Momoh government who had been in detention at the Pa Demba Road prison, including former inspector general of police Bambay Kamara, were also executed. On 5 July 1994 the deputy NPRC leader Seargent Solomon Musu, who was very popular with the general population, particularly in Freetown, was arrested and sent into exile after he was accused of planning a coup to topple Strasser, an accusation Seargent Musa denied. Strasser replaced Musa as deputy NPRC chairman with Captain Julius Maada Bio, who was instantly promoted by Strasser to Brigadier. The NPRC proved to be nearly as ineffectual as the Momoh-led APC government in repelling the RUF. More and more of the country fell to RUF fighters, and by 1994 they held much of the diamond-rich Eastern Province and were at the edge of Freetown. In response, the NPRC hired several hundred mercenaries from the private firm Executive Outcomes. Within a month they had driven RUF fighters back to enclaves along Sierra Leone's borders, and cleared the RUF from the Kono diamond-producing areas of Sierra Leone. With Strasser's two most senior NPRC allies and commanders Lieutenant Sahr Sandy and Lieutenant Solomon Musa no longer around to defend him, Strasser's leadership within the NPRC Supreme Council of State was not considered much stronger. On 16 January 1996, after about four years in power, Strasser was arrested in a palace coup at the Defence Headquarters in Freetown by his fellow NPRC soldiers. Strasser was immediately flown into exile in a military helicopter to Conakry, Guinea. After nine months in office, the junta was overthrown by the Nigerian-led ECOMOG forces, and the democratically elected government of president Kabbah was reinstated in February 1998. On 19 October 1998 24 soldiers in the Sierra Leone army were executed by firing squad after they were convicted in a court martial in Freetown, some for orchestrating the 1997 coup that overthrew President Kabbah and others for failure to reverse the mutiny. In 2014 an Ebola virus epidemic in Sierra Leone began, which had widespread impact on the country, including forcing Sierra Leone to declare a state of emergency. By the end of 2014 there were nearly 3000 deaths and 10 thousand cases of the disease in Sierra Leone. The epidemic also led to the Ouse to Ouse Tock in September 2014, a nationwide three-day quarantine. The epidemic occurred as part of the wider Ebola virus epidemic in West Africa. In early August 2014 Sierra Leone cancelled league football (soccer) matches because of the Ebola epidemic. On 16 March 2016, the World Health Organisation declared Sierra Leone to be free from Ebola. Several mudslides occurred around 6:30 AM on the fourteenth of August 2017 in and near the country's capital Freetown. Sierra Leone is located on the southwest coast of West Africa, lying mostly between latitudes 7° and 10°N (a small area is south of 7°), and longitudes 10° and 14°W. The country is bordered by Guinea to the north and east, Liberia to the southeast, and the Atlantic Ocean to the west and southwest. Until 2002, Sierra Leone lacked a forest management system because of the civil war that caused tens of thousands of deaths. Deforestation rates have increased 7.3% since the end of the civil war. On paper, 55 protected areas covered 4.5% of Sierra Leone as of 2003. The country has 2,090 known species of higher plants, 147 mammals, 626 birds, 67 reptiles, 35 amphibians, and 99 fish species. Sierra Leone is a constitutional republic with a directly elected president and a unicameral legislature. The current system of the Government of Sierra Leone is based on the 1991 Sierra Leone Constitution. Sierra Leone has a dominant unitary central government and a weak local government. The executive branch of the Government of Sierra Leone, headed by the president of Sierra Leone has extensive powers and influences. The president is the most powerful government official in Sierra Leone. The president is the head of state, the head of government and the commander-in-chief of the Sierra Leone Armed Forces. The president appoints and heads a cabinet of ministers, which must be approved by the Parliament. The president is elected by popular vote to a maximum of two five-year terms. The president is the highest and most influential position within the government of Sierra Leone. The current president of Sierra Leone is former military junta leader Julius Maada Bio. Bio defeated Samura Kamara of the ruling All People's Congress in the country's tightly contested 2018 presidential election. Bio replaced outgoing President Ernest Bai Koroma after Bio was sworn into office on 4 April 2018 by Chief Justice Abdulai Cham. Bio is the leader of the Sierra Leone People's Party, the current ruling party in Sierra Leone. The Parliament of Sierra Leone is unicameral, with 124 seats. Each of the country's fourteen districts is represented in parliament. 112 members are elected concurrently with the presidential elections; the other 12 seats are filled by paramount chiefs from each of the country's 12 administrative districts. The Sierra Leone parliament is led by the Speaker of Parliament, who is the overall leader of Parliament and is directly elected by sitting members of parliament. The current speaker of the Sierra Leone parliament is Sheku Badara Bashiru Dumbuya, who was elected by members of parliament on 21 January 2014. The current members of Parliament of Sierra Leone were elected in the 2012 Sierra Leone parliamentary election. The All People's Congress (APC) currently has 70 of the 112 elected parliamentary seats and the Sierra Leone People's Party (SLPP) has 42 of the elected 132 parliamentary seats. Sierra Leone's two most dominant parties, the APC and the SLPP, collectively won every elected seats in Parliament in the 2012 Sierra Leone parliamentary election. To be qualified as Member of Parliament, the person must be a citizen of Sierra Leone, must be at least 21 years old, must be able to speak, read and write the English language with a degree of proficiency to enable him to actively take part in proceedings in Parliament; and must not have any criminal conviction. The judicial power of Sierra Leone is vested in the judiciary, headed by the Chief Justice and comprising the Sierra Leone Supreme Court, which is the highest court in the country and its ruling therefore cannot be appealed; the High Court of Justice; the Court of Appeal; the magistrate courts; and traditional courts in rural villages. The president appoints and parliament approves Justices for the three courts. The Judiciary have jurisdiction in all civil and criminal matters throughout the country. The current acting Chief Justice of Sierra Leone is Valicious Thomas. The Sierra Leone Ministry of Foreign Affairs and International Cooperation is responsible for foreign policy of Sierra Leone. Sierra Leone has diplomatic relations that include China, Russia, Libya, Iran, and Cuba. Sierra Leone has good relations with the West, including the United States, and has maintained historical ties with the United Kingdom and other former British colonies through membership in the Commonwealth of Nations. The United Kingdom has played a major role in providing aid to the former colony, together with administrative help and military training since intervening to end the Civil War in 2000. The Republic of Sierra Leone is composed of four regions: the Northern Province, Southern Province, the Eastern Province, and the Western Area. Three provinces are further divided into 12 districts; and the Western Area is divided into two districts. The provincial districts are divided into 149 chiefdoms, which have traditionally been led by paramount chiefs, recognised by the British administration in 1896 at the time of organising the Protectorate of Sierra Leone. The Paramount Chiefs are very influential, particularly in villages and small rural towns. Each chiefdom has ruling families that were recognised at that time; the Tribal Authority, made up of local notables, elects the paramount chief from the ruling families. Typically, chiefs have the power to "raise taxes, control the judicial system, and allocate land, the most important resource in rural areas." Within the context of local governance, the districts are governed as localities. Each has a directly elected local district council to exercise authority and carry out functions at a local level. In total, there are 19 local councils: 13 district councils, one for each of the 12 districts and one for the Western Area Rural, and six municipalities also have elected local councils. The six municipalities include Freetown, which functions as the local government for the Western Area Urban District, and Bo, Bonthe, Kenema, Koidu, and Makeni. While the district councils are under the oversight of their respective provincial administrations, the municipalities are directly overseen by the Ministry of Local Government & Community Development and thus administratively independent of district and provincial administrations. Sierra Leone is a country that is exposed to vulnerable situations (not so as a result of the non-existence of natural wealth), but more to do with poor management of its natural wealth (linked with the concept of resource curse). There are a number of systems of transport in Sierra Leone, which has a road, air and water infrastructure, including a network of highways and several airports. There are 11,300 kilometres (7,000 miles) of highways in Sierra Leone, of which 904 km (562 mi) are paved (about 8% of the roads). Sierra Leone highways are linked to Conakry, Guinea, and Monrovia, Liberia. There are ten regional airports in Sierra Leone, and one international airport. The Lungi International Airport located in the coastal town of Lungi in Northern Sierra Leone is the primary airport for domestic and international travel to or from Sierra Leone. Passengers cross the river to Aberdeen Heliports in Freetown by hovercraft, ferry or a helicopter. Helicopters are also available from the airport to other major cities in the country. The airport has paved runways longer than 3,047 metres (9,997 feet). The other airports have unpaved runways, and seven have runways from 914 to 1,523 metres (2,999 to 4,997 feet) long; the remaining two have shorter runways. As of May 2014 the country's only international airport had regularly scheduled direct flights to London, Paris, Brussels and most major cities in West Africa. As of 2016, access to electricity in Sierra Leone was at about 12% for the entire population. Of this 12%, about 10% of the population was located in the urban capital, Freetown. This leaves around 2% of the rural population with access to electricity. The majority of the population relies on biomass fuels for their daily survival, with firewood and coal used most prevalently. The burning of these sources has been reported to have adverse health effects on women and children. A 2012 study was done on the correlation between Acute Respiratory Infection (ARI), and burning biomass fuels in the home. The results were that 64% of children were diagnosed with ARI where firewood stoves were used, and 44% where charcoal stoves were used. The use of coal and firewood has also posed environmental concerns as they are both conflict with the push for more sustainable sources energy. As a result, the commercialization of firewood and coal has been a point of contention with aid donors and government agencies such as the Ministry of Energy and Water Resources and the Forestry Division. There have been strong pushes for both solar and hydropower to become the dominant sources of energy in Sierra Leone because of the UN's Sustainable Development Goals, particularly goal number seven (affordable and clean energy). Sierra Leone's tropical climate, heavy annual rainfall, and abundance of rivers give it potential to realistically pursue more solar and hydropower alternatives. In conjunction with the UK's Department for International Development (DFID), Sierra Leone has set the goal to provide solar power to all of its citizens by 2025. This overarching goal has been broken down into smaller goals as well. The first of these goals is to provide solar power to at least 50,000 homes in 2016, the second is 250,000 homes by 2017, and finally to provide power to 1,000,000 people by 2020. This initiative falls under the Energy Africa access campaign which seeks to provide electricity to 14 different African countries by 2030. Previous to this compact agreement, Sierra Leone's private sector for solar energy was weak, as it provided energy to less than 5% of the target population. Part of the reason for this was due to the import duties and taxes and the lack of quality control. In order to ensure that the Energy Africa goal is met, Sierra Leone has agreed to remove its import duties and Value Added Tax (VAT) on certified solar products. This change will attempt to encourage foreign investment while providing affordable, quality solar products to its citizens. It is estimated that there will be a 30% to 40% cost reduction on solar products with the lack of duties and taxes. As of 2012, Sierra Leone has 3 main hydroelectric plants. The first is the Guma plant which was decommissioned in 1982, the second is the Dodo Plant which is located in the Eastern Province, and finally the Bumbuna plant. There is also potential for several new hydroelectric plants to be opened on the Sewa River, Pampana River, Seli River, Moa River, and Little Scarcies. Amongst all these projects, both finished and potential, the Bumbuna dam still remains the largest of the hydroelectric projects in Sierra Leone. It is located near the Seli River and Freetown and was estimated to produce about 50 megawatts of electricity. There were plans to increase its capacity 400 megawatts by 2017 which would cost around $750 million. It has been projected that the Bumbuna dam could potentially reduce the amount of spending on foreign fuel and save the country at least $2 million a month. In the past this project received its funding of over $200 million from a combination of the World Bank, the African Development Bank, and the Italian company Salini Impregilo. In 2013 Sierra Leone had an officially projected population of 6,190,280 and a growth rate of 2.216% a year. The country's population is mostly young, with an estimated 41.7% under 15, and rural, with an estimated 62% of people living outside the cities. As a result of migration to cities, the population is becoming more urban with an estimated rate of urbanisation growth of 2.9% a year. English is the official language, spoken at schools, government administration and in the media. Krio (derived from English and several indigenous African languages, and the language of the Sierra Leone Krio people) is the most widely spoken language in virtually all parts of Sierra Leone. As the Krio language is spoken by 90% of the country's population, it unites all the different ethnic groups, especially in their trade and interaction with each other. The populations quoted above for the five largest cities are from the 2004 census. The figure for Freetown is for the Western Urban Area (Greater Freetown). Other figures are estimates from the source cited. Different sources give different estimates. Some claim that Magburaka should be included in the above list, but there is considerable difference among sources. One source estimates the population at 14,915, whilst another puts it as high as 85,313. "Pandebu-Tokpombu" is presumably the extended town of Torgbonbu, which had a population of 10,716 in the 2004 census. "Gbendembu" had a larger population of 12,139 in that census. In the 2004 census, Waterloo had a population of 34,079. Sierra Leone is officially a secular state, although Islam and Christianity are the two main religions in the country. The constitution of Sierra Leone provides for freedom of religion and the Sierra Leone Government generally protects it. The Sierra Leone Government is constitutionally forbidden from establishing a state religion, though Muslim and Christian prayers are usually held in the country at the beginning of major political occasions, including presidential inauguration and the official opening of the new session of Parliament. According to a 2010 estimates by the Pew Research Center 78% of Sierra Leone's population are Muslims (mostly Sunni), 20.9 are Christians (mostly Protestants) and 1% belong to a traditional African religion or other beliefs. The Inter-Religious Council of Sierra Leone estimated that 77% of Sierra Leone's population are Muslims, 21% are Christians, and 2% are followers of traditional African religion. Most of Sierra Leone's ethnic groups are Muslim majority, including the country's two largest ethnic groups: the Mende and Temne. Sierra Leone is regarded as one of the most religiously tolerant countries in the world. Muslims and Christians collaborate and interact with each other peacefully. Religious violence is very rare in the country. Even during the Sierra Leonean Civil War people were never targeted because of their religion. The country is home to the Sierra Leone Inter-Religious Council, which is made up of both Christian and Muslim religious leaders to promote peace and tolerance throughout the country. The Islamic holidays of Eid al-Fitr, Eid al-Adha and Maulid-un-Nabi (Birthday of the Prophet Muhammad) are observed as national holidays in Sierra Leone. The Christian holidays of Christmas, Boxing Day, Good Friday and Easter are also national holidays in Sierra Leone. In politics the overwhelming majority of Sierra Leoneans vote for a candidate without regard of the candidate being a Muslim or a Christian. All of Sierra Leone"s Heads of State have been Christians except Ahmad Tejan Kabbah, who was a Muslim. The vast majority of Sierra Leonean Muslims are adherent to the Sunni tradition of Islam. Most of the Mosques and Islamic schools across Sierra Leone are based in Sunni Islam. A significant portion of Sierra Leonean Muslims, at over 10 percent of the country's Muslim population are adherents to Ahmadiyya Islam. Sierra Leone has a vibrant Ahmaddiya Muslim population, and there are five hundred Ahmaddiyya Mosque across Sierra Leone.. Shia Islam does not have strong present in Sierra Leone, and there are very few Shia Muslims in the country. Most of Sierra Leonean Muslims of the Sunni and Ahmadiyya sect regularly pray together in the same Mosque. The Maliki school is by far the largest and most dominant Islamic school of jurisprudence across Sierra Leone and is based within Sunni Islam, though many Ahmadiyya Muslims in Sierra Leone also follow the Maliki Jurisprudence. The Sierra Leone Islamic Supreme Council, is the highest Islamic religious organization in Sierra Leone and is made up of the country's Imams, Islamic scholars, and other Islamic clerics across the country. Sheikh Muhammad Taha Jalloh is the president of the Sierra Leone Supreme Islamic Council. The United Council of Imams, is an influential Islamic religious body in Sierra Leone, that is made up of all imams of mosques throughout Sierra Leone. The president of the United Council of Imam is Sheikh Alhaji Muhammad Habib Sheriff.. The two largest mosques in Sierra Leone are the Freetown Central Mosque and the Ghadafi Central Mosque (built by former Libyan leader Muammar Gaddafi), both located in the capital Freetown. Among the present most highly prominent Sierra Leonean Muslim scholars and preachers are Sheikh Abu Bakarr Cotco Kamara, Sheikh Muhammad Taha Jalloh, Sheikh Umarr S. Kanu, Sheikh Ahmad Tejan Sillah, Sheikh Saeedu Rahman, and Sheikh Muhammad Habib Sheriff. All of the Sierra Leonean Muslim Scholars mention above are Sunni Muslims, except Sheikh Ahmad Tejan Sillah, who is a Shia Muslim; and Sheikh Saeedu Rahman, who is an Ahmaddiya Muslim. The large majority of Sierra Leonean Christians are Protestant, of which the largest groups are the Wesleyan _ Methodists. Other Christian Protestant denominations with significant presence in the country include Presbyterians, Baptists, Seventh-day Adventists Anglicans, Lutherans, and Pentecostals. The Council of Churches is the Christian religious organisation that is made up of Protestant churches across Sierra Leone. Recently there has been an increase of Pentecostal churches, especially in Freetown. In September 2017, a Sierra Leone-based Nigerian Pentecostal Christian pastor name Victor Ajisafe was arrested by the Sierra Leone Police and held in jail after he preached an extreme religious intolerance and a fanatical hate speech against Islam and Sierra Leonean Muslims in particular at his church sermon in the capital Freetown. Ajisafe was apparently angry and jealous after a Zimbabwean internationally renowned Muslim cleric Mufti Menk visited Sierra Leone and had approximately over one hundred thousand people in and outside the national stadium in Freetown to listen to his Islamic sermon in his visit to Sierra Leone on 21 to 23 September 2017. Many Christian organizations in Sierra Leone, including the Council of Churches condemned Ajisafe's sermon against Islam and Muslims. Ajisafe"s church was temporarily shut down by the Sierra Leone government and his church license was temporarily suspended too. The incident brought religious tension in Sierra Leone, in a country known for its very high level of religious tolerance, as many Sierra Leonean Muslims at home and abroad were extremely angry, many called for Ajisafe to be deported back to his home country of Nigeria. The pastor while in Sierra Leone police custody apologized to Sierra Leonean Muslims and to the government of Sierra Leone. After several days in jail, Ajisafe was released, his church license was given back to him, and his church was later reopened under strict government condition during several months of probation. Non-denominational Christians form a significant minority of Sierra Leone's Christian population. Catholics are the largest group of non-Protestant Christians in Sierra Leone, forming about 8% of Sierra Leone's population and 26% of the Christian population in Sierra Leone. The Jehovah’s Witnesses and Mormons are the two most prominent non Trinitarian Christians in Sierra Leone, and they form a small but significant minority of the Christian population in Sierra Leone. A small community of Orthodox Christians resides in the capital Freetown. Sierra Leone is home to about sixteen ethnic groups, each with its own language. The largest and most influential are the Temne at about 36%, and the Mende at about 33%. The Temne predominate in the Northern Sierra Leone and the areas around the capital of Sierra Leone. The Mende predominate in South-Eastern Sierra Leone (with the exception of Kono District). The vast majority of Temne are Muslims at over 85%; and with a significant Christian minority at about 10%. The Mende are also Muslim majority at about 70℅, though with a large Christian minority at about 30%. Sierra Leone's national politics centres on the competition between the north-west, dominated by the Temne, and the south-east dominated by the Mende. The vast majority of the Mende support the Sierra Leone People's Party (SLPP); while the majority of the Temne support the All People's Congress (APC). The Mende, who are believed to be descendants of the Mane, originally occupied the Liberian hinterland. They began moving into Sierra Leone slowly and peacefully in the eighteenth century. The Temne are thought to have come from Futa Jallon, which is in present-day Guinea. The third-largest ethnic group are the Limba at about 6.4% of the population. The Limba are native people of Sierra Leone. They have no tradition of origin, and it is believed that they have lived in Sierra Leone since before the European encounter. The Limba are primarily found in Northern Sierra Leone, particularly in Bombali, Kambia and Koinadugu District. The Limba are about 60% Christian and 40% Muslims. The Limba are close political allies of the neighbouring Temne. One of the biggest minority ethnic groups are the Fula at around 3.4% of the population. Descendants of seventeenth- and eighteenth-century Fula migrant settlers from the Fouta Djalon region of Guinea, they live primarily in the northeast and the western area of Sierra Leone. The Fula are virtually all Muslims at over 99℅. The Fula are primarily traders, and many live in middle-class homes. Because of their trading, the Fulas are found in nearly all parts of the country. The other ethnic groups are the Mandingo (also known as Mandinka). They are descendants of traders from Guinea who migrated to Sierra Leone during the late nineteenth to mid-twentieth centuries. The Mandika are predominantly found in the east and the northern part of the country. They predominate in the large towns, most notably Karina, in Bombali District in the north; Kabala and Falaba in Koinadugu District in the north; and Yengema, Kono District in the east of the country. Like the Fula, the Mandinka are virtually all Muslims at over 99℅. Sierra Leone's third president Ahmad Tejan Kabbah, and Sierra Leone's first Vice-President Sorie Ibrahim Koroma were both ethnic Mandingo. Next in proportion are the Kono, who live primarily in Kono District in Eastern Sierra Leone. The Kono are descendants of migrants from Guinea; today their workers are known primarily as diamond miners. The majority of the Kono ethnic group are Christians, though with an influential Muslim minority. Sierra Leone's former Vice-President Alhaji Samuel Sam-Sumana is an ethnic Kono. The small but significant Krio people (descendants of freed African American, West Indian and Liberated African slaves who settled in Freetown between 1787 and about 1885) make up about 3% of the population. They primarily occupy the capital city of Freetown and its surrounding Western Area. Krio culture reflects the Western culture and ideals within which many of their ancestors originated – they also had close ties with British officials and colonial administration during years of development. The Krio have traditionally dominated Sierra Leone's judiciacy and Freetown's elected city council. One of the first ethnic groups to become educated according to Western traditions, they have traditionally been appointed to positions in the civil service, beginning during the colonial years. They continue to be influential in the civil service. The vast majority of Krios are Christians at about 90%, though with a small but significant Muslim minority at 10% known locally as Oku. Other minority ethnic groups are the Kuranko, who are related to the Mandingo, and are largely Muslims. The Kuranko are believed to have begun arriving in Sierra Leone from Guinea in about 1600 and settled in the north, particularly in Koinadugu District. The Kuranko are primarily farmers; leaders among them have traditionally held several senior positions in the Military. The current Governor of the Bank of Sierra Leone Kaifala Marah is an ethnic Kuranko. The Kuranko are largely Muslim majority. The Loko in the north are native people of Sierra Leone, believed to have lived in Sierra Leone since the time of European encounter. Like the neighbouring Temne, the Loko are Muslim majority. The Susu and their related Yalunka are traders; both groups are primarily found in the far north in Kambia and Koinadugu District close to the border with Guinea. The Susu and Yalunka are both descendants of migrants from Guinea; and they both are virtually all Muslims at over 99%. 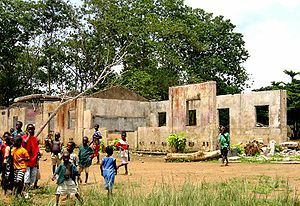 The Kissi live further inland in South-Eastern Sierra Leone. They predominate in the large town of Koindu and its surrounding areas in Kailahun District. The vast majority of Kissi are Christians. The much smaller Vai and Kru peoples are primarily found in Kailahun and Pujehun Districts near the border with Liberia. The Kru predominate in the Kroubay neighbourhood in the capital Freetown. The Vai are largely Muslim majority at about 90℅, while the Kru are virtually all Christians at over 99℅. Although women account for about 50 percent of the population in Sierra Leone, only 28 percent are household heads. As in the rest of the countries, education is a key factor in succeeding in aspects such as a well-paid jobs and covering the needs of a house. Rural areas are the most common to lack access to education having only male-headed four percent ahead of females with basic education and 1.2 percent more at post-graduate level. In Sierra Leone, normally, men are automatically positioned as household heads; and their status does not change if their marital status changes over time. However, female household does change depending on their marital status. A woman can be the head of the house only if she remains single for the rest of her life. But if a woman gets married, she will not be entitled as the head of the house anymore. Females can take over the household head if they become widowed or divorced. In the labor field, it is expected that the household will financially provide the needs of the family. However, females face gender discrimination making them the target of lower incomes and financial struggle. In numbers, females present a lower per cent (6.3) versus males (15.2) when it comes to be paid employees. Children who have been forced to be part of a war have experienced severe mental and emotional damage in Sierra Leone. However, the damage and way to deal with the effects of war depends on the gender of the kids. Both genders experienced and were involved in high levels of violence. Females, experiencing higher levels of rapes, presented greater signs of depression and anxiety. Males, on the other hand, presented higher levels of anxiety and hostility. Males also showed to be more vulnerable to depression after losing a care giver. With women being more than half the population of Sierra Leone, they contribute in great part to the country's economy and society. Sierra Leonean women in care-giving positions were particularly susceptible to the disease because of the potential close contact with infected individuals. If and when the infected person died, women were in charge of preparing the funeral, which involves touching the infected body which in turn gave women a high risk of becoming infected. The vulnerability in infected women with Ebola grows when health institutions can not provide a high quality service because they are full or do not have the right equipment to treat the patients. In certain societies such as Sierra Leone, the lack of social and economic support for women makes them more vulnerable, making them the target of gender violence . By managing to repress women, men possess greater power and become the decision-maker. The method to implement gender-based violence can vary; it can be sexual, physical, verbal, economical, or emotional. Violence does not respect factors such as age, socio-economical position, or education. Denouncing violence is hard for most women due to the honor and reputation of their family name. A victim, who suffers from violence, begins to lose self-confidence due to fear of reporting the aggressor or exposing family problems. This is why a woman who suffers from physical violence prefers not to attend with a specialist to heal her wounds. In some other cases, when females dare to denounce the crime, the system is very corrupt that authorities involved accept bribes from the victimizer. Small female-operated business not only could contribute to Sierra Leone's economy, it could also help women to become independent in several ways. However, women face discrimination when it comes to obtain financial, social, and cultural help to start a business. It is difficult to avoid the economic paralysis in Sierra Leone given that more than half of the population in the country is women. Due to the lack of access to basic education, women are the least prepared when in comes to process business license, register the name or contracting. Not having the capital to start a new business is the biggest barrier for women. With the lack of technology, mostly in all Sierra Leone, it is hard to help a business to function. According to 2010 estimates, Sierra Leone has the 5th highest maternal mortality rate in the world. According to a 2013 UNICEF report, 88% of women in Sierra Leone have undergone female genital mutilation. As of 2014[update], Sierra Leone was estimated as having the 11th highest infant mortality rate in the world. Under legislation enacted in 1980, all newspapers must register with the Ministry of Information and pay sizeable registration fees. The Criminal Libel Law, including Seditious Libel Law of 1965, is used to control what is published in the media. In 2006, President Ahmad Tejan Kabbah committed to reforming the laws governing the press and media to create a freer system for journalists to work in. As of 2013[update] Sierra Leone is ranked 61st (up two slots from 63rd in 2012) out of 179 countries on Reporters Without Borders' Press Freedom Index. Print media is not widely read in Sierra Leone, especially outside Freetown and other major cities, partially due to the low levels of literacy in the country. In 2007 there were 15 daily newspapers in the country, as well as those published weekly. Among newspaper readership, young people are likely to read newspapers weekly and older people daily. The majority of newspapers are privately run and are often critical of the government. The standard of print journalism tends to be low owing to lack of training, and people trust the information published in newspapers less than that found on the radio. The United Nations Mission in Sierra Leone (UNIOSIL) ran one of the most popular stations in the country, broadcasting programs in a range of languages. The UN mission were restructured in 2008 and it was decided that the UN Radio would be merged with SLBS to form the new Sierra Leone Broadcasting Corporation (SLBC). This merger eventually happened in 2011 after the necessary legislation was enacted. SLBC transmits radio on FM and has two television services, one of which is uplinked by satellite for international consumption. 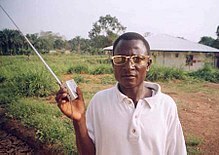 FM relays of BBC World Service (in Freetown, Bo, Kenema and Makeni), Radio France Internationale (Freetown only) and Voice of America (Freetown only) are also broadcast. Outside the capital Freetown and other major cities, television is not watched by a great many people, although Bo, Kenema and Makeni are served by their own relays of the main SLBC service. There are three free terrestrial television stations in Sierra Leone, one run by the government SLBC and the other two are private stations in Freetown, Star TV which is run by the owner of the Standard Times newspaper and AYV - Africa Young Voices. There are a number of religious funded TV stations that operate intermittently. Two other commercial TV operators (ABC and AIT) closed after they were not profitable. In 2007, a pay-per-view service was also introduced by GTV as part of a pan-African television service in addition to the nine-year-old sub-Saharan Digital satellite television service (DStv) originating from Multichoice Africa in South Africa. GTV subsequently went out of business, leaving DStv as the only provider of subscription satellite television in the country. A number of organisations planned to operate digital terrestrial subscription TV services, with Multichoice's Go TV having built infrastructure ahead of getting a licence and ultimately failing to get a license. ITV and SATCON are currently operational. Internet access in Sierra Leone has been sparse but is on the increase, especially since the introduction of 3G/4G cellular phone services across the country. There are several main internet service providers (ISPs) operating in the country. Freetown has internet cafés and other businesses offering internet access. Problems experienced with access to the Internet include an intermittent electricity supply and a slow connection speed in the country outside Freetown. Odelay mask by Temne people. Brooklyn Museum. When the Leone Stars win an important match, many youth across the county rush to the street to celebrate. Many of the Sierra Leone national team footballers play for teams based in Europe although virtually all of them started professional football in the Sierra Leone National Premier League. Many of the national team footballers are celebrities across Sierra Leone and they are often well known by the general population. Some of Sierra Leonean international footballers include Mohamed Kallon, Mohamed Bangura, Rodney Strasser, Kei Kamara, Ibrahim Teteh Bangura, Mustapha Dumbuya, Christian Caulker, Alhassan Bangura, Sheriff Suma, Mohamed Kamara, Umaru Bangura and Julius Gibrilla Woobay. 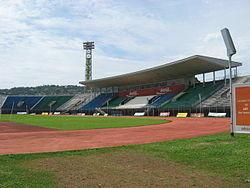 In 2009, the Sierra Leone Under-19 team finished second in the African Under-19 Championship in Zambia, thus qualifying for the Under-19 World Cup qualifying tournament with nine other teams. However, the team was unable to obtain Canadian visas to play in the tournament, which was held in Toronto. Although tennis is not very popular in the country, up-and-coming American player Frances Tiafoe is the son of two Sierra Leoneans who emigrated to the United States. Sierra Leone is the first African country to join the International Floorball Federation. ^ Thomas, Abdul Rashid (22 December 2018). "Sierra Leone parliament approves new Chief Justice". ^ a b c Official projection (medium variant) for the year 2013 based on the population and housing census held in Sierra Leone on 4 December 2004 Archived 30 July 2013 at the Wayback Machine. statistics.sl. page 13. ^ a b c d "Sierra Leone". International Monetary Fund. Retrieved 18 April 2013. ^ Encarta Encyclopedia. Sierra Leone (country). Archived from the original on 28 February 2008. Retrieved 19 February 2008. ^ "National Electoral Commission – Press Release" (PDF). 6 September 2017. Archived from the original (PDF) on 14 November 2017. Retrieved 1 February 2018. ^ "Sierra Leone unveils new geographical map". Africa Review. Retrieved 1 February 2018. ^ "The World Factbook". www.cia.gov. Retrieved 7 October 2015. ^ "All things happily to all men". The Economist. 31 May 2014. ^ Batty, Fodei J. (2010). What Role for Ethnicity? Political Behavior and Mobilization in Post-Conflict Sierra Leone and Liberia (Ph.D.). Western Michigan University. ^ "Sierra Leone Population below poverty line (%)". Indexmundi.com. 30 June 2015. Retrieved 5 July 2018. ^ "Houses at Sierra-Leone". The Wesleyan Juvenile Offering: A Miscellany of Missionary Information for Young Persons. X: 55. May 1853. Retrieved 29 February 2016. ^ Countries and Their Cultures. "Culture of Sierra Leone". Retrieved 22 February 2008. ^ Encyclopædia Britannica. "Sierra Leone History". Retrieved 19 February 2008. ^ Encyclopedia of the Nations. "Sierra Leone – History". Retrieved 22 February 2008. ^ "Pedro da çintra did not name Sierra Leone: An Exploration into available evidence". Sierra Leone Concord Times. 22 June 2017. Retrieved 26 May 2017. ^ LeVert, Suzanne (2006). Cultures of the World: Sierra Leone. Marshall Cavendish. p. 22. ISBN 978-0-7614-2334-8. ^ Sibthorpe, A. B. C. (1970). The History of Sierra Leone. Routledge. p. 7. ISBN 978-0-7146-1769-5. ^ National Maritime Museum (20 August 2015). "Sir John Hawkins". Archived from the original on 16 May 2011. Retrieved 9 December 2008. ^ Pham, John-Peter (2005). Child Soldiers, Adult Interests: The Global Dimensions of the Sierra Leonean Tragedy. Nova Publishers. pp. 4–8. ISBN 978-1-59454-671-6. Retrieved 17 June 2014. ^ Michael Sivapragasam, Why Did Black Londoners not join the Sierra Leone Resettlement Scheme 1783–1815? (London: Open University, 2013). ^ Fyfe, Christopher (1992). Our Children Free and Happy: Letters from Black Settlers in Africa in the 1790s. Edinburgh University Press. ^ "Sierra Leone's struggle for progress". The Economist. 11 December 2008. Retrieved 22 August 2010. ^ Simon Schama, Rough Crossings (London: 2005), pp. 380–383. ^ Harris, Sheldon H. (1972): Paul Cuffe: Black America and the African Return, New York: Simon and Schuster, pp. 32–33, especially note 15 on p. 140. ^ Schwarz, Suzanne (5 January 2013). "Reconstructing the Life Histories of Enslaved Africans: Sierra Leone, c. 1808–19". ^ a b Schwartz, Suzanne (2012). "Reconstructing the Life Histories of Liberated Africans: Sierra Leone in the Early Nineteenth Century". History in Africa. ^ History, Sierra-leone.org, Retrieved 17 January 2007. ^ Killson, Martin (1966) Political Change in a West African State: A Study of the Modernization Process in Sierra Leone, Cambridge, Massachusetts, USA, pp. 60; also pp. 106, 107, 110, 111, 186–188 on other riots and strikes. ^ The Committee Office, House of Commons (6 March 2006). "House of Commons – International Development – Memoranda". Publications.parliament.uk. Retrieved 17 June 2014. ^ "Sierra Leone Web - Sierra Leonean Heroes - Achievement of Independence". www.sierra-leone.org. ^ "How Independence Was Won". Newafricanmagazine.com. Archived from the original on 29 October 2013. Retrieved 19 March 2014. ^ a b Murtala Mohammed Kamara (28 February 2011). "Sierra Leone was ripe for Independence: Exclusive interview with Reginald Boltman". News.sl. Archived from the original on 26 November 2013. Retrieved 17 June 2014. ^ a b Momoh, John (4 May 2011). "Sierra Leone: Viewpoint – Celebrating a New Nation!". allAfrica.com. Retrieved 20 May 2012. ^ "BBC ON THIS DAY | 27 | 1961: Sierra Leone wins independence". BBC News. 27 April 1961. Retrieved 20 May 2012. ^ "Sierra Leone Web - Sierra Leonean Heroes - Achievement of Independence". www.sierra-leone.org. Retrieved 28 November 2018. ^ Pham, John-Peter (2005). Child soldiers, adult interests: the global dimensions of the Sierra Leonean tragedy. Nova Publishers. pp. 33–35. ISBN 978-1-59454-671-6. Retrieved 17 June 2014. ^ "History of Sierra Leone". Worldrover.com. Retrieved 20 May 2012. ^ Gberie, Lansana (2005). A dirty war in West Africa: the RUF and the destruction of Sierra Leone. C. Hurst & Co. Publishers. pp. 26–27. ISBN 978-1-85065-742-2. Retrieved 17 June 2014. ^ Rotberg, Robert I. (2003). State failure and state weakness in a time of terror. Brookings Institution Press. p. 80. ISBN 978-0-8157-7574-4. Retrieved 17 June 2014. ^ Politicized security forces or tribalized national politics; which is which? Archived 1 September 2012 at the Wayback Machine. Newstime Africa. Retrieved on 26 February 2013. ^ a b c "Sierra Leone". 2001 Findings on the Worst Forms of Child Labor. Bureau of International Labor Affairs, U.S. Department of Labor. 2002. Archived from the original on 2 November 2013. This article incorporates text from this source, which is in the public domain. ^ "NPRC's Komba Kambo Speaks After Eleven Years Of Silence! : Sierra Leone News". News.sl. Archived from the original on 22 February 2014. Retrieved 17 June 2014. ^ a b "SIERRA LEONE NOW: Attempts To Launder Maada Bio's Battered Image Fail... We Were Not Supreme Council Members – Civilians In NPRC Deny Involvement In Atrocities". Salonenow.blogspot.com. Retrieved 20 March 2014. ^ "STANDARD TIMES PRESS SIERRA LEONE NPRC's Ruthlessness No Death Certificates For 29 Sierra Leoneans PAGE". Standardtimespress.org. 23 June 2010. Retrieved 20 May 2012. ^ "FSL Vol 2 No 1". Focus-on-sierra-leone.co.uk. Archived from the original on 28 September 2013. Retrieved 23 September 2013. ^ "How Sierra Leone fell into the hands of young soldiers". Thefreelibrary.com. Retrieved 20 May 2012. ^ Document – Sierra Leone: Imminent execution / death penalty / legal concern |Amnesty International . Amnesty.org (1998). Retrieved on 26 February 2013. ^ Bah, M. (1998). The Worlds Most Resilient People. London: Alpha. ^ a b Sierra Leone. Internationalsos.com. Retrieved on 24 February 2017. ^ "Sierra Leone country profile". BBC News. 4 January 2017. Retrieved 21 February 2017. ^ "Sierra Leone launches three-day, door-to-door Ebola prevention campaign". UNICEF. Retrieved 24 September 2014. ^ "Sierra Leone cancels all soccer matches over Ebola outbreak". NY Daily News. Retrieved 7 October 2014. ^ Amt, Auswärtiges. "Auswärtiges Amt – Sierra Leone: Reise- und Sicherheitshinweise". Auswärtiges Amt DE (in German). Retrieved 16 March 2018. ^ a b LeVert, Suzanne (2006). Cultures of the World: Sierra Leone. Marshall Cavendish. p. 7. ISBN 978-0-7614-2334-8. ^ a b c d e f "Sierra Leone". The World Factbook. CIA. Retrieved 15 September 2011. ^ Blinker, Linda (September 2006). Country Environment Profile (CEP) Sierra Leone. Freetown, Sierra Leone: Consortium Parsons Brinckerhoff. p. 12. Archived from the original on 27 September 2013. Retrieved 2 July 2013. ^ LeVert, Suzanne (2006). Cultures of the World: Sierra Leone. Marshall Cavendish. pp. 8–9. ISBN 978-0-7614-2334-8. ^ a b UNCCD (2004). "National Report on the Implementation of the United Nations Convention to Combat Desertification (UNCCD): Sierra Leone" (PDF). p. 39. Archived from the original (PDF) on 18 February 2012. Retrieved 24 November 2011. ^ a b Angelsen, Arild; et al. (2009). "Reducing Emissions from Deforestation and Forest Degradation (REDD): An Options Assessment Report" (PDF). Meridian Institute for the Government of Norway. pp. 75–77. Retrieved 24 November 2011. ^ Hogan, C. Michael (2009). Painted Hunting Dog: Lycaon pictus Archived 9 December 2010 at the Wayback Machine. GlobalTwitcher.com. ^ "Sierra Leone". Environmental Justice Foundation. 17 September 2009. Archived from the original on 10 October 2008. ^ CNN, Bukola Adebayo,. "Sierra Leone declares former junta head president". CNN. Retrieved 5 April 2018. ^ "Sierra Leone National Election Commission Bulletin". September – December 2011. Retrieved 25 February 2012. ^ Ambassade de la Fédération de Russie en République de Guinée. "Russia and Sierra Leone diplomatic relations". mid.ru. Retrieved 2 May 2017. ^ "Background Note: Sierra Leone". U.S. Department of State. October 2008. Retrieved 7 October 2008. ^ "Welcome to the Mano River Union Website". Mano River Union. 2006. Retrieved 7 October 2008. ^ "Ministry of Foreign Affairs and International Relations". Sierra Leone Encyclopedia. 2007. Archived from the original on 23 February 2009. Retrieved 7 October 2008. ^ a b Renner-Thomas, Ade (2010). Land Tenure in Sierra Leone: The Law, Dualism and the Making of a Land Policy. AuthorHouse. pp. 6–7. ISBN 978-1-4490-5866-1. Retrieved 17 June 2014. ^ "Sierra Leone". Commonwealth Local Government Forum. Retrieved 12 January 2018. ^ "SIERRA LEONE HUMAN DEVELOPMENT REPORT 2007" (PDF). United Nations Development Programme. Retrieved 12 January 2018. ^ "Final Results 2004 population and housing census" (PDF). Statistics Sierra Leone. p. 3. Retrieved 17 June 2014. ^ "Provisional Results" (PDF). Sierra Leone 2015 Population and Housing Census. Statistics Sierra Leone. March 2016. ^ "Bombali – profile of geographical entity including name variants". World Gazetteer. Archived from the original on 11 January 2012. Retrieved 20 May 2012. ^ a b "Port Loko". World-gazetteer.com. Archived from the original on 11 January 2012. Retrieved 20 May 2012. ^ "Tonkolili – profile of geographical entity including name variants". World Gazetteer. Archived from the original on 25 March 2012. Retrieved 20 May 2012. ^ "Kambia – profile of geographical entity including name variants". World Gazetteer. Archived from the original on 11 January 2012. Retrieved 20 May 2012. ^ "Kenema – profile of geographical entity including name variants". World Gazetteer. Archived from the original on 11 January 2012. Retrieved 20 May 2012. ^ a b "Kailahun – profile of geographical entity including name variants". World Gazetteer. Archived from the original on 11 January 2012. Retrieved 20 May 2012. ^ "Bo – profile of geographical entity including name variants". World Gazetteer. Archived from the original on 7 April 2012. Retrieved 20 May 2012. ^ "Bonthe". World-gazetteer.com. Archived from the original on 23 May 2012. Retrieved 20 May 2012. ^ "Summary (Sierra Leone) – Jane's World Air Forces". Janes.com. 30 July 2010. Retrieved 22 August 2010. ^ Turay, Aruna (26 March 2009). "In Sierra Leone, Army Chief of Defence Staff Commends Troops". News.sl. Archived from the original on 27 March 2012. Retrieved 20 May 2012. ^ "Partners: Sierra Leone Armed Forces". Daco-sl.org. Archived from the original on 11 January 2010. Retrieved 20 May 2012. ^ "Economic Methodology: Paradox of Ceteris Paribus (CP) Law in the Context of Sierra Leone". Economic Insights – Trends & Challenges. 3 July 2016. Retrieved 15 September 2017. ^ a b "Settling for a future in Sierra Leone". New Agriculture. November 2007. Retrieved 20 February 2011. ^ a b African Development Bank, OECD – Organisation for Economic Co-operation and Development (2009). African Economic Outlook 2009: Country Notes: Volumes 1 and 2. OECD Publishing. pp. 561–562. ISBN 978-92-64-07618-1. ^ König, Dirk (2008). Linking Agriculture to Tourism in Sierra Leone – a Preliminary Research. GRIN Verlag. p. 67. ISBN 978-3-638-94680-3. ^ Catling, David (1992). Rice in deep water. Int. Rice Res. Inst. p. 372. ISBN 978-971-22-0005-2. ^ Rice today, Volume 3:Rice facts. International Rice Research. 2004. p. 48. ^ "UN targets 'blood diamonds' trade". BBC News. 1 August 2003. Retrieved 28 April 2011. ^ Sierra Leone News : Africell Presents Second Consignment of Food to all Quarantined Homes Archived 6 October 2014 at the Wayback Machine. News.sl. Retrieved on 24 February 2017. ^ a b c d e "Energy Africa Access Campaign Policy Compact Sierra Leone Final Report" (PDF). assets.publishing.service.gov.uk. Retrieved 16 December 2018. ^ a b c Taylor, Eldred Tunde; Nakai, Satoshi (19 June 2012). "Prevalence of Acute Respiratory Infections in Women and Children in Western Sierra Leone due to Smoke from Wood and Charcoal Stoves". International Journal of Environmental Research and Public Health. 9 (6): 2252–2265. doi:10.3390/ijerph9062252. ISSN 1660-4601. PMC 3397376. PMID 22829802. ^ a b Munro, Paul; van der Horst, Greg; Healy, Stephen (June 2017). "Energy justice for all? Rethinking Sustainable Development Goal 7 through struggles over traditional energy practices in Sierra Leone". Energy Policy. 105: 635–641. doi:10.1016/j.enpol.2017.01.038. ISSN 0301-4215. ^ a b c d "NATIONAL ENERGY PROFILE OF SIERRA LEONE [JUNE, 2012]" (PDF). www.undp.org. Retrieved 16 December 2018. ^ a b c "Sierra Leone solar push aims to bring electricity to all by 2025". Reuters. 11 May 2016. Retrieved 16 December 2018. ^ a b "The endgame of the Bumbuna hydroelectric plant project". Centre for Public Impact (CPI). Retrieved 16 December 2018. ^ "Sierra Leone signs MoU for $750 million hydro power boost". Reuters. 26 May 2011. Retrieved 16 December 2018. ^ "Hydro brings light and hope to Sierra Leone". Reuters. 24 September 2009. Retrieved 16 December 2018. ^ a b Renner-Thomas, Ade (2010). Land Tenure in Sierra Leone: The Law, Dualism and the Making of a Land Policy. AuthorHouse. p. 5. ISBN 978-1-4490-5866-1. Retrieved 17 June 2014. 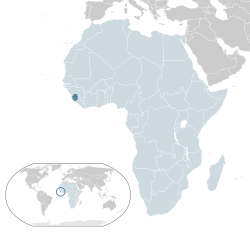 ^ "Sierra Leone Overview". United Nations Development Programme Sierra Leone. Archived from the original on 11 May 2011. Retrieved 3 June 2008. ^ "Krio Translation Services". Language9.com. Retrieved 20 May 2012. ^ Oyètádé, B. Akíntúndé; Fashole-Luke, Victor (15 February 2008). "Sierra Leone: Krio and the Quest for National Integration". Language and National Identity in Africa. Oxford: Oxford University Press. pp. 122–140. ^ "Final Results 2004 population and housing census" (pdf). Government of Sierra Leone. 2006. Retrieved 26 February 2011. ^ "Population of Magburaka". Population-of.com. Retrieved 22 August 2010. ^ "Exaf". Exaf.eu. Retrieved 22 August 2010. ^ "Religions in Sierra Leone | PEW-GRF". ^ "All things happily to all men". The Economist. ^ Admini (3 March 2016). "SIERRA LEONE HAILED FOR RELIGIOUS TOLERANCE". AYV Newspaper. ^ "Media Centre – In Sierra Leone, partnerships with religious leaders help combat child mortality". UNICEF. 29 November 2010. Retrieved 20 March 2014. ^ "Conflict Transformation qqw". Religions for Peace International. Archived from the original on 28 February 2014. Retrieved 20 March 2014. ^ "Interreligious Community Advocates for Peace in Sierra Leone with photos". Gbgm-umc.org. Archived from the original on 17 July 2013. Retrieved 20 March 2014. ^ Bah, Hadi. "Ahmadiyya Movement Goes Mainstream in Sierra Leone". sierraleone365.com. Retrieved 6 December 2016. ^ onedeentech (10 April 2018). "National President of the Supreme Islamic Council of Sierra Leone Congratulates H.E (Rtd) Juilius Maada Bio and his vice, Dr. Mohamed Juldeh Jalloh". Sierra Leone Islamic Web. ^ Shiite, Ahmadiyya and Sunni Under One Umbrella – Sierra Express Media. Sierraexpressmedia.com. Retrieved on 24 February 2017. ^ "United Methodists elect bishop for Sierra Leone". UMC.org. 22 December 2008. Archived from the original on 6 May 2010. Retrieved 23 September 2013. ^ "Methodist Church Sierra Leone — World Council of Churches". Oikoumene.org. 28 January 2013. Retrieved 23 September 2013. ^ "Crosspoint United Methodist Church – Welcome » Sierra Leone". Xpointumc.org. Archived from the original on 27 September 2013. Retrieved 23 September 2013. ^ "The History of the Evangelical Fellowship of Sierra Leone". Efsl.evang.org. 24 August 1959. Archived from the original on 28 September 2013. Retrieved 23 September 2013. ^ "The Evangelical College of Theology Sierra Leone". Tectsl.org. Retrieved 23 September 2013. ^ "Evangelical Presbyterian Church, Sierra Leone Presbytery Organization [WO-486]". Epc.org. Archived from the original on 23 September 2013. Retrieved 23 September 2013. ^ "Sierra Leone ::: A Place to Belong, Not Just Attend". Tmbcdetroit.org. 23 July 2010. Retrieved 23 September 2013. ^ "Seventh-day Adventist Church, Sierra Leone – HOME". Sdachurchsierraleone.org. Retrieved 23 September 2013. ^ "West Africa-Freetown (Sierra Leone)". Anglican Communion. Retrieved 23 September 2013. ^ "elcsl.weebly.com". elcsl.weebly.com. Retrieved 20 March 2014. ^ "Sierra Leone – Evangelical Lutheran Church in America". Elca.org. 16 June 2010. Archived from the original on 17 October 2013. Retrieved 23 September 2013. ^ "Sierra Leone Christians Preparing for PilgrFile: Sierra Leone News". News.sl. Archived from the original on 4 March 2014. Retrieved 17 June 2014. ^ "Sierra Leone: in wake of brutal war, churches full: News Headlines". Catholic Culture. 28 September 2011. Retrieved 23 September 2013. ^ "catholicchurchsl.org". catholicchurchsl.org. Retrieved 20 March 2014. ^ "Visitors & Tours: Jehovahs Witnesses Office in Sierra Leone". Jw.org. Retrieved 23 September 2013. ^ "Sierra Leone – LDS Statistics and Church Facts | Total Church Membership". Mormonnewsroom.org. 24 July 2007. Retrieved 23 September 2013. ^ Gerry Avant (2 December 2012). "Historic milestone: Sierra Leone stake marks LDS Church's 3,000th". Deseret News. Retrieved 23 September 2013. ^ Troubled Orthodox Mission in Sierra Leone | News from Greeks in Africa, Asia, and South America. World.greekreporter.com. Retrieved on 24 February 2017. ^ "Sierra Leone: The Temnes and the Politics of the All Peoples' Congress (APC)". Thenewpeople.com. Retrieved 17 June 2014. ^ a b c d e f g Fatou Taqi, Fatou, Marian, Alimatu; Marian Vinnie-Wilson; Alimatu Vandi (2015). "Sierra Leone 2015 Population and Housing Census Thematic Report on Gender" (PDF). ^ a b c Betancourt, Theresa S.; Borisova, Ivelina I.; de la Soudière, Marie; Williamson, John (1 July 2011). "Sierra Leone's Child Soldiers: War Exposures and Mental Health Problems by Gender". Journal of Adolescent Health. 49 (1): 21–28. doi:10.1016/j.jadohealth.2010.09.021. ISSN 1054-139X. PMC 3124662. ^ a b c Freetown, Jeanne Kamara in (14 October 2014). "We can no longer ignore Ebola's wider impact – particularly on women | Jeanne Kamara". the Guardian. Retrieved 15 November 2018. ^ a b c d e Thomas, Abdul Rashid (26 September 2013). "Gender equality in Sierra Leone is an economic imperative". Retrieved 15 December 2018. ^ Wang, Lianqin (2007). Education in Sierra Leone: Present Challenges, Future Opportunities. World Bank Publications. p. 2. ISBN 978-0-8213-6868-8. ^ "Human Development Report 2009 – Proportion of international migrant stocks residing in countries with very high levels of human development (%)". Hdrstats.undp.org. Archived from the original on 6 June 2009. Retrieved 22 August 2010. ^ Wang, Lianqin (2007). Education in Sierra Leone: Present Challenges, Future Opportunities. World Bank Publications. p. 1 and 3. ISBN 978-0-8213-6868-8. ^ Jones-Parry, Rupert, ed. (2006). Commonwealth Education Partnerships 2007. Nexus Strategic Partnerships Ltd. ISBN 978-0-9549629-1-3. Retrieved 17 June 2014. ^ "Njala University College (Nuc)". Sierra Leone: Sierra Leone Encyclopedia. July 2007. Archived from the original on 11 March 2007. Retrieved 25 June 2008. ^ a b Envoys from five countries present credentials to president, Jerusalem Post. Jpost.com (3 November 2015). Retrieved on 24 February 2017. ^ "CIA – The World Factbook Life Expectancy". Cia.gov. Retrieved 25 June 2014. ^ "2006 Report on the global AIDS epidemic". UNAIDS. 2006. Archived from the original (PDF) on 17 January 2008. Retrieved 24 January 2008. ^ Anne Jung (December 2012). "Wealth, but no health". D+C Development and Cooperation/ dandc.eu. Retrieved 17 June 2014. ^ Donaldson, Ross (2009). The Lassa Ward: One Man's Fight Against One Of The World's Deadliest Diseases. Macmillan. pp. 34–35. ISBN 9781429987073. ^ a b "The Primary Health Care Hand Book Policing". Ministry of Health & Sanitation. 25 May 2007. Archived from the original (doc) on 17 February 2008. Retrieved 24 January 2008. ^ Agyepong I. A Systems View and Lesson from the Ongoing Ebola Virus Disease Outbreak in West Africa. Ghana Medical Journal [serial online]. September 2014;48(3):168–172. Available from: Academic Search Complete, Ipswich, MA. Accessed 28 October 2014. ^ "The economic impact of Ebola may kill more people than the virus itself". Big News Network.com. 6 September 2014. Retrieved 8 September 2014. ^ "Unreported World 2009 series, ep.4: Sierra Leone: Insanity of War". Channel4.com. 3 April 2009. Retrieved 20 May 2012. ^ Lisk, Radcliffe (2007). "Sierra Leone". Practical Neurology. 7 (3): 198–201. doi:10.1136/jnnp.2007.120089. PMID 17515600. ^ COUNTRY COMPARISON :: MATERNAL MORTALITY RATE. The World Factbook — Central Intelligence Agency. ^ COUNTRY COMPARISON :: INFANT MORTALITY RATE. The World Factbook — Central Intelligence Agency. ^ a b WHO/UNICEF Joint Monitoring Programme for Water Supply and Sanitation (updated March 2010) "Estimates for the use of Improved Drinking-Water Sources, Sierra Leone" (PDF). Archived from the original (PDF) on 26 December 2011. Retrieved 6 August 2011. ^ "China Lends $28.8 Million USD to Sierra Leone for Orugu Dam". OOSKAnews. 15 June 2009. Retrieved 20 May 2012. ^ Nataliya Pushak; Vivien Foster (June 2011). "Sierra Leone's Infrastructure. A Continental Perspective" (PDF). Policy Research Working Paper 571. World Bank. pp. 31–35. Retrieved 6 August 2011. ^ Sierra Leone Demographic and Health Survey 2008. (PDF) . Retrieved on 24 February 2017. ^ Massaquoi, Rachel C. J. (2011). Foods of Sierra Leone and Other West African Countries: A Cookbook. AuthorHouse. p. 5. ISBN 9781449081546. Retrieved 17 June 2014. ^ Albala, Ken (2011). Food Cultures of the World Encyclopedia. ABC-CLIO. p. 165. ISBN 9780313376276. Retrieved 17 June 2014. ^ "At Long Last, Recruitment Begins at Sierra Leone Broadcasting Corporation | ICFJ – International Center for Journalists". ICFJ. 17 March 2011. Archived from the original on 29 October 2013. Retrieved 20 March 2014. ^ "Sierra Leone Broadcasting Corporation (SLBC) Maiden Report 2010-2011" (PDF). Archived from the original (PDF) on 11 August 2013. ^ Thomson Reuters Foundation (24 October 2013). "Sierra Leone – Editorial criticizing president prompts multiple proceedings". Trust.org. Retrieved 20 March 2014. ^ "Sierra Leone editors arrested after publishing article comparing pres…". 25 October 2013. Archived from the original on 25 October 2013. ^ Greenslade, Roy (25 October 2013). "Editor arrested for comparing Sierra Leone president to a rat | Media". The Guardian. Retrieved 20 March 2014. ^ "Sierra Leone editors arrested after publishing article comparing president to a rat". Fox News. 21 October 2013. Retrieved 20 March 2014. ^ "Sierra Leone intensifies media crackdown – News". africareview.com. Retrieved 20 March 2014. ^ "Sierra Leone: In Sierra Leone, Journalists Held On Libel, Sedition Charges". allAfrica.com. 24 October 2013. Retrieved 20 March 2014. ^ Wilson, Harry (2005). "Press Freedoms and Human Rights:2005 Year End Press Freedom Brief". Commonwealth Press Union. Archived from the original on 24 November 2007. Retrieved 20 April 2008. ^ a b c "Sierra Leone – Annual report 2006". Reporters without Borders:For Press Freedom. 2006. Archived from the original on 14 June 2009. Retrieved 20 April 2008. ^ "Press Freedom Index 2013". Reporters without Borders. 2013. Archived from the original on 15 February 2013. Retrieved 2 July 2013. ^ a b c "Media use, and attitudes towards media in Sierra Leone:A comprehensive baseline study" (PDF). BBC World Service Trust and Search for Common Ground. June 2007. Retrieved 19 April 2007. ^ Jalloh, Tanu (28 December 2007). "Sierra Leone: Newspaper Development". Freetown, Sierra Leone: Concord Times. Retrieved 19 April 2008. ^ Banham, Martin (2004). A history of theatre in Africa. Cambridge University Press. p. 171. ISBN 978-0-521-80813-2. Retrieved 17 June 2014. ^ Conteh, Prince Sorie (2009). Traditionalists, Muslims, and Christians in Africa: interreligious encounters and dialogue. Cambria Press. pp. 23–24. ISBN 978-1-60497-596-3. Retrieved 17 June 2014. ^ Manson, Katrina; James Knight (2009). Sierra Leone. Bradt Travel Guides. pp. 42–45. ISBN 978-1-84162-222-4. Retrieved 17 June 2014. ^ "Cricinfo article Uganda and Sierra Leone Win Through". Cricinfo.com. 5 May 2009. Retrieved 20 May 2012. ^ "Visa Issues End Sierra Leone's World Cup Dream". Cricinfo article. 7 September 2009. Retrieved 20 May 2012. Keen, David (2005). Conflict and Collusion in Sierra Leone. Oxford: James Currey. ISBN 978-0-85255-883-6. Retrieved 17 June 2014. Kup, Alexander Peter (1961). A History of Sierra Leone, 1400–1787. Cambridge: Cambridge University Press. ISBN 978-0-7864-1814-5. Sillinger, Brett (2003). Sierra Leone: Current Issues and Background. New York: Nova Science Publishers. ISBN 978-1-59033-662-5. Utting, Francis A (1931). The Story of Sierra Leone. Ayer Company Publishers. ISBN 978-0-8369-6704-3. Sierra Leone Truth and Reconciliation Commission. TRC Report. Retrieved 14 May 2016. Levinson, Robby (1998). Ethnic Groups Worldwide: A Ready Reference Handbook. Phoenix: Oryx Press. ISBN 978-1-57356-019-1. Scholia has a topic profile for Sierra Leone. "Sierra Leone". The World Factbook. Central Intelligence Agency.